The South Korean city of Kwangju is home to the Kwangju Uprising of 1980, named after the city it took place in. Motivated by the outrage of the newly passed marital law and the general dissatisfaction of Chun Doo-hwan’s military dictatorship, student protesters took to the streets on May 18th. The protesting lasted until May 27th when the militarized forces gained enough power to cripple the demonstration indefinitely. On the morning of May 18th about 200 students from the Chonnam University began demonstrating and by mid day more than 800 more people had joined them. With the approval of the United States, the military government released paratroopers to put an end to the demonstration. These paratroopers were trained for assault missions and behaved accordingly by brutally beating, and arresting the protesters. Those of the students that had been forcibly arrested were then piled into various trucks where they continues to be beaten as they were taken away. The next day, many more people joined the protesters that were still left (http://countrystudies .us/South-Korea/21.htm). Paratroopers once again resorted to brutality, even some policemen were against the incredible force being used against the protesters and when they tried to release captives, they too were bayoneted and beaten by the military forces. The paratroopers used lethal force and opened fire on the protesters with M-16s. On May 20th, the newspaper Militants’ Bulletin was published for the first time, and reported on the actual events of the uprising. That night the march grew to over 200,000 people in a city with a population of roughly 700,000 (http://libcom.org/history1980-the-kwangju-uprising). With the continued failure of the media to report on the situation in Kwangju, thousands of the protesters took their frustration to the media buildings and set them on fire, along with the tax offices and 16 police cars. The following day, in an effort to fight back against the bullets being shot at them, protesters started seizing military vehicles from a local military contractor. They soon had 350 vehicles and started driving these expropriated vehicles around the city, rallying demonstrators together and going to neighboring towns and villages to spread the revolt. Soon the protesters raided police stations and National Guard armories for weapons. The estimated amount of those killed ranges from a few hundred to over 2,000 people killed during the nine day uprising (http://www.jstor.org.gate.lib. buffalo.edu). During the time of the uprising the media was so censored that nothing was being reported. Not even any of the deaths; instead, the reports that came out were fabricated stories of vandalism and trivial police involvement (http://libcom.org/history/1980-the-kwangju-uprising). Women were an integral part of the demonstration, at one point during the protesting seven busloads of women textile workers went to Naju, where they seized hundreds of rifles and ammunition and brought them back to Kwangju. 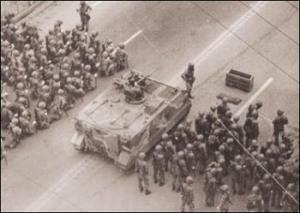 The protesters tried to bring the uprising to Chunju and Seoul, but it was unsuccessful. The military’s control on travel and media was very strong and it prevented the spread of the uprising to the rest of the nation (http://global.factiva.com.gate). By the evening of the 20th the protesters had control of the city. They kept that control for six days until May 27th when military forces engulfed the city and took power back. The US supported Chun’s suppression of the Kwangju Uprising in order to impose a neoliberal economic regime. The involvement of the United States was motivated by their desire to advance their economic relationship with South Korea, resulting in a meeting in the White House on May 22 discussing what they should do about Korea. 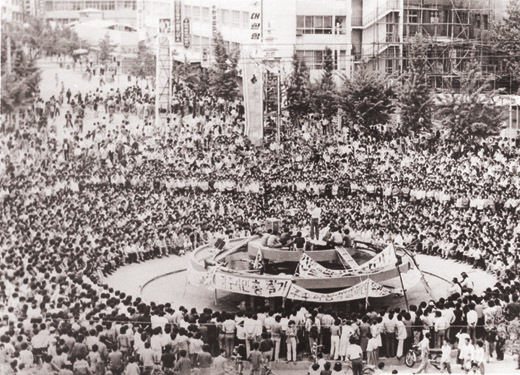 The result of this meeting was an overall agreement that order had to be placed on Kwangju by suppressing the protesters uprising The U.S. government “decided to support the restoration of security and order in South Korea while deferring pressure for political liberalization” (institute_US-gwangju.ppt.mov.ppt). The following day in Seoul, U.S. Ambassador William Gleysteen had a meeting with Korean Prime Minister Park Choong-hoon during this meeting Gleysteen acknowledged that “firm anti-riot measures were necessary.” President Carter told a CNN interviewer on May 31 that security interests must sometimes override human rights concerns (http://www.jstor.org.gate.lib. buffalo.edu). Subsequently, during this time the U.S. decided to allow the president of the US Export-Import Bank, John Moore to go on his visit to Seoul so that he could arrange U.S. financing of large Korean contracts for US nuclear power plants (http://global.factiva.com.gate). At this time the Senior American officer in Korea, General John Wickham “accepted and agreed to the request by the Korean government to allow the use of certain selected Korean armed forces under his operational control in operations to subdue the crowds” (http://global.factiva.com.gate). Furthermore, the U.S. Ambassador Gleysteen wrote in a telegram to Washington “..less concerned over the democratic development, if military leadership can develop an apparently stable structure and invigorate the economy than U.S. business and banking circles will be prepared to go back to business as usual (with Korea)” (institute_US-gwangju.ppt.mov.ppt). The U.S. was worried that large American corporations wouldn’t want to do business with Korea do to this instability, so the U.S. encouraged Chun to provide stability by ending the protesters uprising. To further the business relationship with Chun and American investors, on June 13 after the uprising in May the U.S. had Chun dine with leaders of the American Chamber of Commerce in Korea, including the president of 3-M and representatives of Bank of America, Dow Chemical, and Gulf Oil. As well as in September, Chun visited to America where he met Davis Rockefeller; their photo was printed in The New York Times. Then, not but three days later, the Korean government announced new policies about relaxed foreign investments, plus 100% foreign ownership of companies, 100% repatriation of funds invested from abroad, and foreigners’ ownership of land (institute_US-gwangju.ppt.mov.ppt). It’s important to question the reasoning for the U.S. involvement in Korea during this time. What are some of the rationalities you might come up with for why we became involved with suppression of the Kwangju uprising, do you think it was purely economic gain?